Bacon and garlic make everything better! These Brussels sprouts are amazing! Yum! Yum! Yum! These are delicious! Think you don’t like Brussels sprouts? Make these – they will change your mind! I whipped these up to go with a couple of venison steaks given to us by my sister and brother-in-law for Christmas. A perfect match for the tasty steaks! Bring a large pot of water to a boil. Meanwhile, heat a large skillet over medium heat. Add the bacon to the skillet and slowly brown it, rendering out the fat. 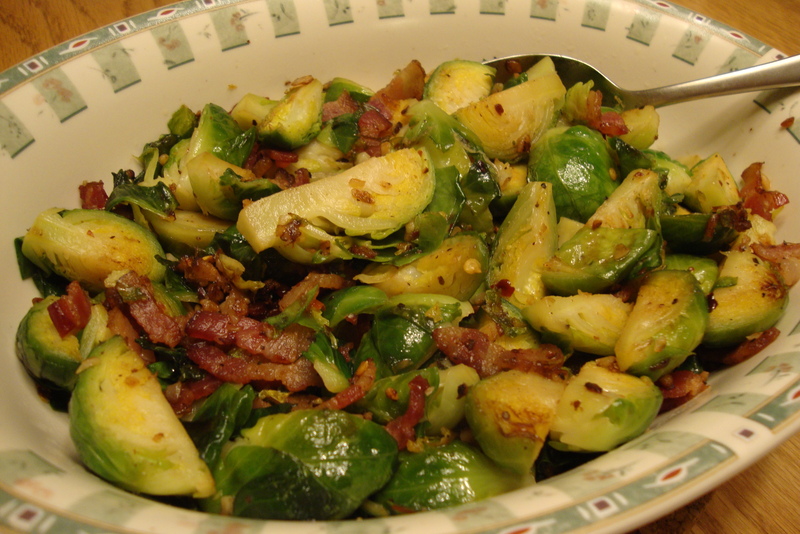 While the bacon is frying, add the Brussels sprouts to the boiling water to blanche them for 2 minutes. Strain the sprouts and run them under cold water to stop the cooking. When the bacon is almost browned and a lot of the fat has rendered out, add the garlic to the skillet. Saute the garlic and bacon for another 30 seconds before adding the Brussels sprouts and red pepper flakes to the skillet. Fry the sprouts until they are lightly browned. Season with sea salt and freshly ground black pepper to taste. Enjoy with your favorite cut of meat! 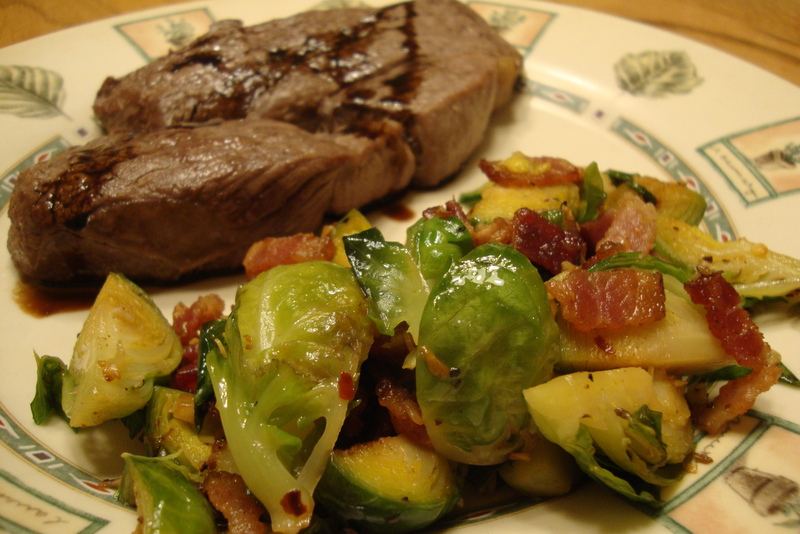 A perfect match for venison steaks drizzled with Balsamic vinegar! Just made this and LOVED them!! I’m amazed! 🙂 🙂 great job! This blog is a way for me to share recipes and other relevant information pertaining to living a healthful, whole foods life! Check out our recipes at Chowstalker! Take time to look at the other great recipes too!